Genomic diversity is shaped by the complex interplay between the effects of genetic drift and natural selection among populations. Several of these effects, especially those of linked selection at neutral sites, adaptive introgression, and barriers to migration (often called “genomic islands”) have been discussed on our blog before, all of which compare diversity within species, or among closely related species. In a recent study, Vijay et al. 2017 propose a “macro-level comparative approach”, comparing genomic diversity across taxa, under the hypothesis that shared patterns of diversity across distantly related taxa are characteristic of shared demographic history (here characterized by the effective population size, Ne, and variants of it) across syntenic regions. Vijay et al. (2017) analyzed shared polymorphisms across publicly available genomes of three disparate clades of Darwin’s finches, flycatchers, and American crows, with ~50 million years of evolution between them. Thereon, summary statistics including population recombination rates, nucleotide diversities, divergences, and Fst were computed in 50 Kb windows. Similarities within and among clades were then computed using Pearson correlations. Results indicated several interesting findings: (1) strong correlations within clades among all summary statistics computed, as expected – for example, dxy is expected to be negatively correlated with Fst under the effects of linked selection (2) high levels of between clade correlations, particularly in dxy estimates, and recapitulation of the negative correlation between dxy and Fst when comparing across clades, and (3) significant correlation across estimates of summary statistics concentrated around sub-telomeric regions, rather than in peri-centromeric regions (which also had reduced diversity, elevated differentiation), indicative of the influence of chromosomal recombination rates in mitigating the effects of linked selection/differential introgression. These results suggest that syntenic genomic regions evolving putatively due to linked natural selection experience similar effects across millions of years of evolution. The degree of correlation among clades was remarkable considering divergence times of several million generations, gaps in syntenic alignments and the statistical error associated with population genetic estimates from moderate samples sizes. 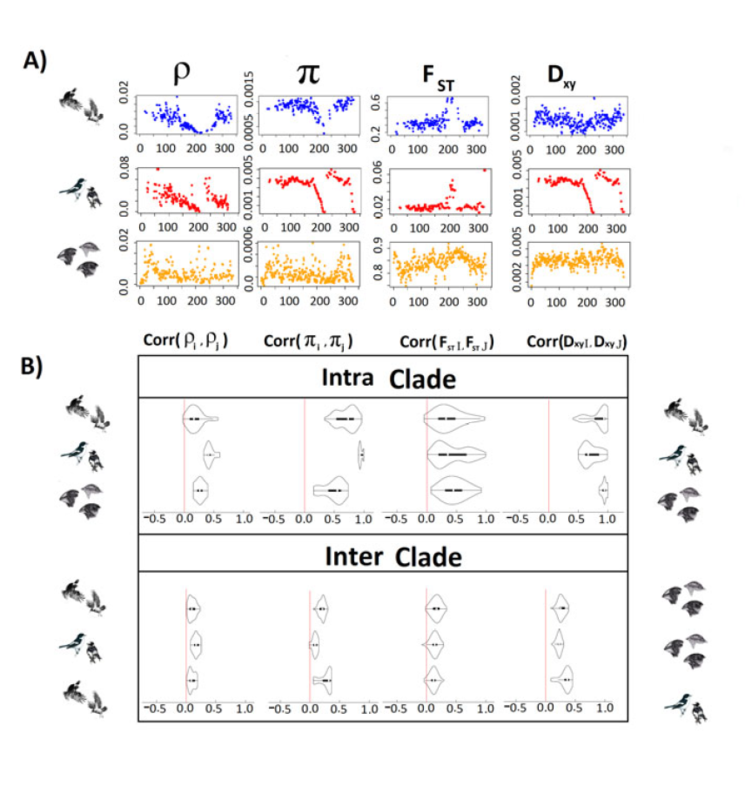 With recombination rate being the key mediator of linked selection, an explanation of genomic parallelism in Ne through linked selection requires conserved recombination landscapes among the clades under investigation. I am a computational biologist, and I build statistical models and tools for population genetics. I am particularly interested in studying the dynamics of structured populations, genetic admixture, and ancestral demography. This entry was posted in adaptation, bioinformatics, birds, evolution, genomics, population genetics, selection and tagged adaptation, Evolution, gene flow, hybridization, natural selection, population genetics. Bookmark the permalink.